Long working distance (LWD) microscope objectives for inverted biological microscopes are either designed to be used with a standard thickness typical of common flasks and petri dishes, or they have correction collars that allow users to precisely focus on the specimen by turning an external ring on the barrel. Long working distance objectives without correction collars are made to work through a thickness of approximately 1.0 - 1.2mm (the thickness of most flasks, petri dishes and multi-well plates). These are the routine lenses for inverted cell culture microscopes. These lenses are moderately priced compared to the LWD lenses with correction collars. 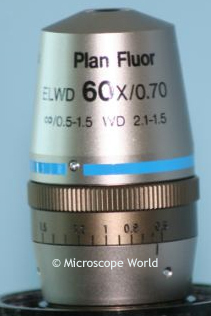 60x Plan Fluor objective lens with correction collar. At 40x and above, the aberrations resulting from a cover slip of less than or greater than 0.17mm noticeably degrade the image. The amount of media used in preparing the sample can also increase the distance required for optimal image quality. To compensate for these problems, more expensive objectives feature a correction collar that adjusts for this distance. The image below is a LWD objective with correction collar which allows a sharper image with more detail. The disadvantage to these lenses is that it takes experience and diligence to use the objective properly. If poorly adjusted the lens will result in an unusable image. 40x LWD microscope objective with correction collar. The scale for the correction collar will be engraved on the barrel. Some start with 0 at one end which would correspond to no cover glass and go up to 2mm. Others start at 0.17, the thickness of a standard cover slip, while others start at 0.5mm. With the microscope objective lens in place, note whether the smaller number is rotated all the way clockwise or counterclockwise. If you are viewing a slide turned upside down on an inverted microscope, you are looking through only a cover glass thickness of 0.17mm and the collar should be turned all the way in the direction of the lower number. Focus on a detail in the specimen as clearly as possible. With one hand controlling the fine focus and the other adjusting the correction collar, turn the collar a small amount and refocus the specimen. If the image improves, turn the collar a little more in the same direction and refocus. If the image improves, repeat. However, if the image becomes worse, turn the collar in the opposite direction and refocus. Continue to do this until you get a sharp and clear image. It is important to turn the collar, then refocus as two distinct steps. If you turn both the collar and the fine focus at the same time, it is very difficult to adjust the collar correctly. If you are looking through a petri dish or flask, put the collar around the 1mm mark to start. If the lens is in place and the scale is 0-2mm, you can estimate the half way point by feel and start from there. It is good to get in the habit of turning either clockwise or counterclockwise first so that you systematically work as efficiently as possible. A slide is approximately 1mm thick, so if you are looking through the thick part of the slide you should set the collar about half way between the petri dish setting. Precisely setting the correction collar on your microscope objective can seem daunting, but if you take the time to practice the procedure, it quickly becomes routine. The difference is a poor image and disappointment in your equipment, or getting excellent images and using a relatively expensive objective in the most advantageous way.